Click on the links below to jump to each section of the page or simply scroll down. HBO song lyrics can now be found on the HBO lyrics page. BBC4 are going to be airing Flight of The Conchords One Night Stand to kick off the Conchords HBO series they are airing starting this month. One Night Stand will screen on BBC4 on Tuesday September 18 at 9:30pm and will be repeated on Friday September 21 at 11pm. Visit BBC4's Conchords page here . My one thought is will they air the episodes out of sequence as happened on HBO or now they are all completed, will they be shown in order and therefore Murray wont suffer computer woes one week, get a new one another, then be back on the old one the following episode... *update* The BBC are going to try to let me know what order the episodes will air, so I'll post the info as soon as it comes in. HBO have been releasing podcasts since the series began and I've finally gotten it together and put them all online for you here. You can also download these via the HBO podcasts or HBO RSS feed. Click on a podcast image to view or download. I've been busy doing some detecting and have upcoming episode blurb for you. While I don't have the final episode write up as yet, I'll go out on a limb here and say I put 1 and 12 together, divided it by a carrot and multiplied it by magic and came up with Todd Barry and Demetri Martin as guest stars for the final episode (The Third Conchord) of Flight of The Conchords. And methinks they might even be using their own names. OK, maybe not Barry and Martin, but you never know as both can also be first names. Sneeky. I'll plump for Todd and Demetri. Friends of the Conchords and funny guys to boot. Episode 1 - Sally - Bret and Jemaine go to a party at Dave's, where Jemaine meets and falls for the 'most beautiful girl in the room', Sally. When it turns out that Sally used to go out with Bret, things get weird between Bret and Jemaine. Episode 2 - Bret Gives Up The Dream - Bret's new job is taking up all his time and so Jemaine starts looking for a new band-mate. Episode 3 - Mugged - Bret and Jemaine are mugged in broad daylight, leading Murray and Dave to give them some advice. Episode 4 - Yoko - Bret and Jemaine's relationship is threatened by the 'Yoko' effect. Episode 5 - Sally Returns - Sally, the ex-girlfriend of both Bret and Jemaine, from the season premiere, returns to further complicate things in the band. Episode 7 - Drive By - Bret and Jemaine arm themselves for a race war with a fruit vender; Murray falls for a tech-support woman at the office. Episode 8 - Girlfriends - Bret and Jemaine pick up two women at a croissant shop--but end up with very different dating experiences. Meanwhile, Murray makes an album deal for the band. Episode 9 - What Goes On Tour - Using the band's "emergency fund," Murray organizes a warm-up tour in preparation for a big gig in Central Park. At an airport bar, the boys get hooked by some "mermaids" from a woman's water-polo team - nearly ruining the tour and their relationship with Murray. Episode 10 - New Fans - The Conchords triple their fan base after playing a local world music jam, but Mel is suspicious of the two new fans' motives. Episode 11 - The Actor - Bret and Jemaine enlist a semi-professional actor to cheer Murray up after a disappointing gig. Asked to place a good-hearted rejection call, the actor gets carried away, offering Murray and the Conchords a recording deal that's too good to be true. Episode 12 -The Third Conchord - Murray introduces a new bongo-playing band member on Bret and Jemaine, triggering angry dances and mutant half-bands. June 18 2007 - So.. how was it for you? As our interview ends, I ask Clement and McKenzie if there's anything they'd like to add about the new show. "Give us one chance, I'm asking the reader," replies Clement, with the faintest earnestness. "Let the readers know that it's our first show we've ever made, and we didn't know what we were doing," adds McKenzie. The Philadelphia Inquirer ran an article yesterday also. TVGuide not wanting to miss out on some Conchords action, came up with a great interview. The guys sounded like they were kicking back a bit. Go read it here. And last but not least, Now Toronto talk Conchords and tiny TV subgenres. Oooerrr! June 12 2007 - New HBO clips. Is it? Isn't it? I'm running out the door, so you'll have to make do with these two clips for now. My one thought about these clips... what have they done to their accents? In the Inner City song Bret sounds like he is trying to be Neil Tennant. Bizzare. And just a little creepy. June 8 2007 - Let the mayhem begin. Or at the very least, slightly chaotic... maybe a little hectic perhaps? 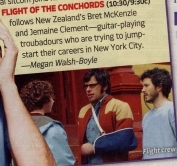 31.05.07 - Read what everyone else thinks about the Conchords and their pilot. I have! Since HBO launched the Conchords TV pilot online people all over the world have an opinion about them and it! 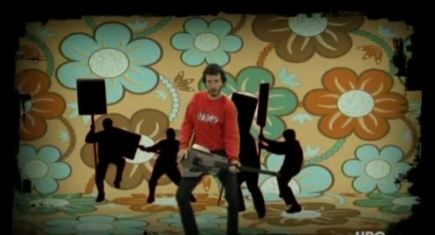 Blogs and websites have given space to the Conchords. Most of them praise the guys and thinks they are wonderful, amazingly funny, good looking (some of the ladies use the word 'hot' I do believe) and extremely talented. That there is some monster ego stroking waffle, so lets hope the rest of the series lives up to expectations. Read what everyone else in blogworld is saying about the Conchords show, in no particular order - TV Squad - EW Popwatch - Spare Room - LAist - Vulture err, ok so only 5 blog people but hey, I guess I talk about a lot of people blogging the Conchords. Not only do I talk about it, I talk about it a lot. Yeah, I do talk about it a lot. I talk about reading lots of blogs. A lot. 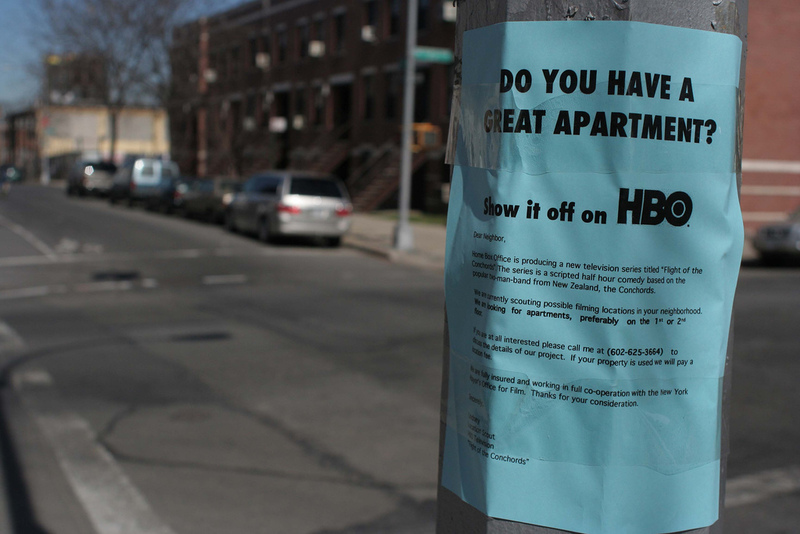 Check out the rest of the HBO Conchords promotions department's hard work here on HBO . Do TheArseOfTheInter... I mean MySpace thing here. New HBO Conchords ad online. Watch/download it further down the page. Thanks again Vanessa. 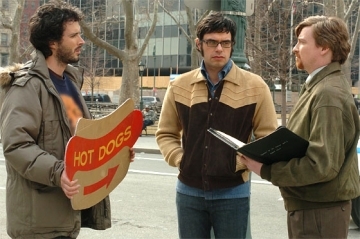 Canadian TV has bought the Conchords HBO series and will air it sometime this summer by the looks of it. Read it on Reuters Canada. Those in New Zealand wondering when they will see it, tune in to Prime later in the year. Read the Prime news here on What The Folk! 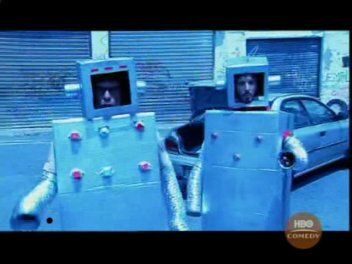 Blogs are going into overdrive with mentions of the Conchords thanks to the HBO push on them. Cool to see. Except now my eyes are worn out. And still wishing people would learn to spell Brit and Germaine correctly. I and three of my friends arrived early and were the first in line. They let us in at 8 PM and the place was decked out with several schmoozing tables and a chic lounge area. There was free beer, wine, popcorn and Indian food for everyone to enjoy. I’d say the crowd was pretty adult, people in their early twenties to late thirties. The venue, which is owned by HBO, got pretty packed but not overly crowded. An employee from Cornerstone introduced the FOTC around 8:40 or so and everyone clapped and cheered. I’m not going to go into detail on the episode but I’ll tell you this much. Very funny, reminded me a little bit of their BBC radio show. It was produced and directed well and they really knew when to hit comedic points. The crowd was definitely into the episode, many people laughing and enjoying themselves. I don’t see any reason why this show won’t be a major hit… then again I am an avid FOTC fan so I guess I’m a tad biased. But I do work in the industry and from my perspective this is a quality show that is well thought out. 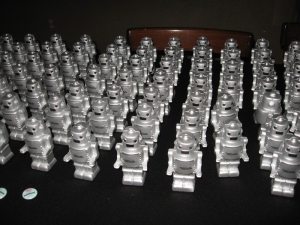 Anyway, we had a great time and the event went off without a hitch. I got plenty sloshed and they even let us take home some of the very large posters they had laying around! Thanks HBO/Cornerstone/FOTC! 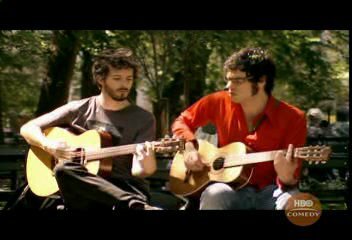 HBO Flight of The Conchords trailers - View here or download to your computer. Download links next to clips. Kristen Schaal - Mel - the Conchords one fan. A dedicated lady. 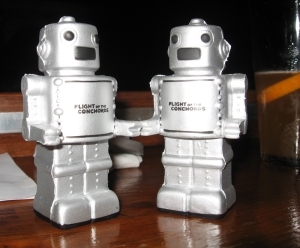 Screencap from HBO FoTC Robots trailer. Location details of the apartment signs - Metropolitan Ave. and Berry St. in Williamsburg, Brooklyn. Others apartment signs are within a few blocks radius of this. Thanks to Will for the info. Do you have a great apartment? Show it off on HBO. 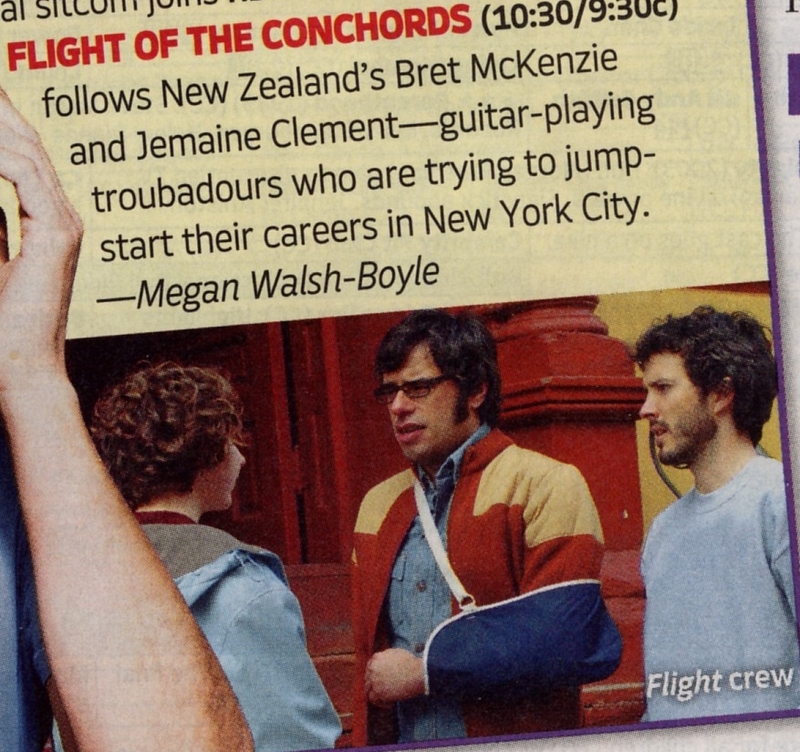 Home Box Office is producing a new television series titled 'Flight of The Conchords'. The series is a scripted half hour comedy based on the popular two-man-band from New Zealand, the Conchords. We are currently scouting possible filming locations in your neighbourhood. We are looking for apartments, preferably on the 1st or 2nd floor. If you are interested please call me at (### ### ####) to discuss the details of our project. If your property is used we will pay a location fee. We are fully insured and working in full co-operation with the New York Mayor's Office for Film. Thanks for your consideration.